He was among the locals and tourists trapped in that little shop when Italian troops declared curfew. An unseasonable cold front lightly dusted medieval Kotor with snow. He couldn’t remain until morning but preferred to leave undetected. He walked past quaint hats and other curios intending to escape out the rear. “Monsieur, stay. You’re safe with us.” The Frenchman thought he was being kind. “I have business elsewhere,” he said in accented French. Antonie slipped into the darkness, encountering the three soldiers patrolling the alley. Later, they’d recall experiencing sudden fatigue. No one knew what happened to the Vampiritic-looking Romanian. I authored this for the Rochelle Wisoff-Fields writing challenge. The idea is to use the image above as the inspiration for crafting a piece of flash fiction no more than 100 words long. My word count is 100. At first, I had no idea what I was looking at. I did a Google image search but it primarily came up with salami and various cloth items. 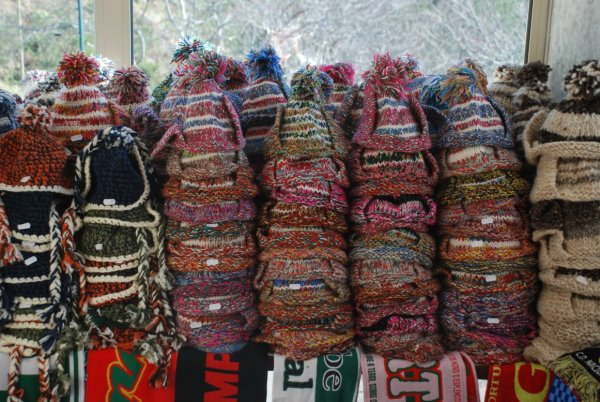 Finally, I was able to figure out they were stacks of knitted hats. I saw the photo was credited to Björn Rudberg so I went to his blog and saw the domain country extension was .me which is Montenegro. I did more Googling (the research took longer than the actual writing) and found the medieval coastal city of Kotor among other things. I couldn’t find a news story that interested me, but noted the history of the area during World War II and how it was primarily occupied by the Italians from 1941 to 1943. That still didn’t provide me with a complete “hook,” so I leveraged the vampire character Antoine from my Sean Becker Undead Series and placed him in Kotor when the Italians first occupied the area in April 1941. Given the snow in the background of the photo, I made up an unseasonable cold snap. I’ve read stories (okay, Marvel’s “Dracula” comic books from the 1970s) which took a modern-day vampire and sometimes set him back in history through flashbacks/memories. I thought I’d try that with Antonie who exists in 2017 but who is thought to be very old. To read other stories based on the prompt, visit InLinkz.com.